The Cuisinart GR-11/TOB-40N/WM-SW2N is a combination of Grill and Panini Press, Toaster Oven and Sandwich Grill.The Cuisinart GR-11 is an electric griddle & panini press appliance that features nonstick, removable grill plates for cooking juicy burgers and crispy grilled sandwiches. The griddler provides the ideal temperature for grilling and takes the guesswork out of cooking. The Cuisinart WM-SW2N is a nonstick electric sandwich grill which is perfect for preparing breakfast, lunch, or light dinners. It has dual indicator lights for indicating and nonstick plates eliminate the need for added butter or oil. This is specially designed to grill two items at a time. 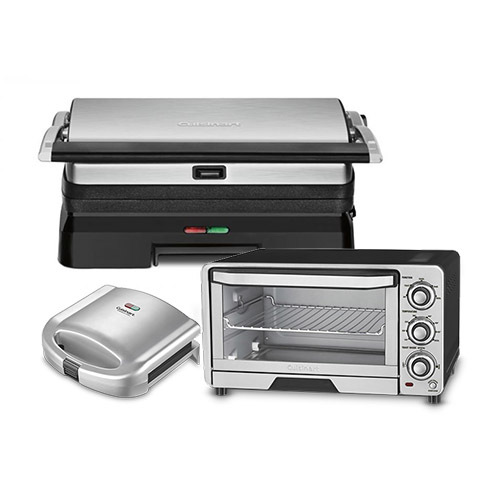 The Cuisinart Grill and Panini Press, Toaster Oven and Sandwich Grill has many exciting features for users of all types. See the Cuisinart Grill and Panini Press, Toaster Oven and Sandwich Grill gallery images above for more product views. 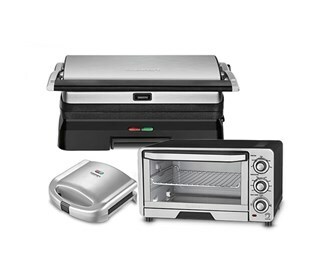 The Cuisinart Grill and Panini Press, Toaster Oven and Sandwich Grill is sold as a Brand New Unopened Item.